Lydia Krefta identified data center efficiency measures as well as campus-wide chiller savings. 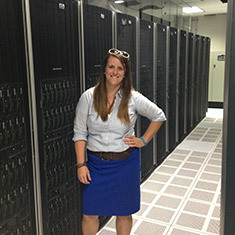 DreamWorks Animation enlisted Lydia Krefta to improve energy efficiency within its on-site data center in Glendale, CA. After baselining energy use, Krefta found opportunities to reduce energy consumption by improving air flow within the data center. These opportunities included optimizing temperature set-points, adding hot aisle containment curtains and installing variable frequency drives and smart communication in the Computer Room Air Conditioners (CRACs). Further, she found potential campus-wide savings by recommending raising the chilled water temperature and installing a water-side economizer at DreamWorks’s central plant, taking advantage of cool evening and winter air to replace chiller operation approximately 20 percent of the year. Overall, these three projects could save DreamWorks Animation nearly $700,000 over ten years, providing 1.5 million kilowatt hours in annual energy savings and over 550 tons in annual greenhouse gas emissions reductions. Lydia Krefta, a student at the University of California, Los Angeles, was hired as the 2013 EDF Climate Corps fellow at DreamWorks Animation.